River condition assessments determine how well the river is functioning and the health of the dependent populations of aquatic and terrestrial species. Riverbend’s assessments include surveying typical cross section(s) of the river, measuring bed sediment sizes, and calculating the basic geomorphic parameters of river pattern and profile. We make a qualitative assessment of aquatic life forms and riparian vegetation. These are all factors to be considered in a restoration design. We also have experience performing more rigorous and quantitative assessments, when the project budget allows. Riverbend has experience with several evaluation and/or classification systems, including Proper Functioning Condition (PFC) assessment, the Hydrogeomorphic Classification (HGM), the Stream Visual Assessment Protocol (SVAP v. 2), the Montgomery and the Rosgen stream classification systems, and the more recent Stream Functions Pyramid assessment tool. Riverbend’s technical staff has the equipment and the experience to measure water quality parameters (pH, turbidity, DO, temp, etc.) and to measure the rate of flow in the river. As with any scientific measurement, the key is to have experienced staff that can apply the measurement or assessment tools in a consistent and verifiable manner. Scroll below or use the menu to the right to read more about the assessments we can do for you. 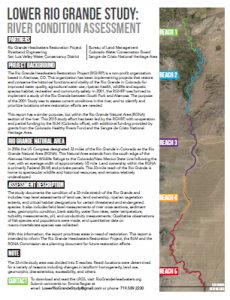 The Rio Grande Headwaters Restoration Project and its outgrowth, the Colorado Rio Grande Restoration Foundation is interested in finding ways to improve the historical functions of the headwaters of the Rio Grande in Colorado. A river condition assessment was completed in 2001 of the first 91 miles (from the upstream town limits of South Fork to the Alamosa – Conejos County line) which resulted in a priority list of projects which are being done in phases. The first four phases have been completed, and more in planning and design phases. Also, Riverbend engineering has done a condition assessment study of the last ~35 miles from below the Alamosa Wildlife Refuge to the Colorado-New Mexico state line–download the 2016 final report here. In the top study area (91 miles) The characteristics of the river are similar in all locations: low gradient, fine grained sediments, active bank erosion and limited woody riparian vegetation. And so, the restoration goals are similar at all of the sites: reduce bank erosion and improve riparian vegetation. By doing so, the health of the river is improved with better shade, reduced water temperatures, improved depth, better continuity of sediment movement and improved riparian habitat. The approach is to 1) flatten the river’s radius of curvature where the curvature gets too small; 2) install rock structures (rock deflectors) on the outside of the re-aligned bends that will resist lateral channel migration and reduce shear stress in the near bank region; and 3) encourage the establishment of a dense riparian vegetation colony on a new floodplain bench on the outside of these same meander bends, so that the vegetation can control the long-term bank stability and rate of erosion/lateral channel migration.